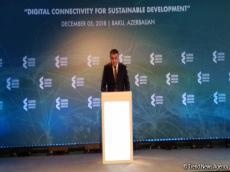 Until 2020, the frequency range of 700-800 megahertz in Azerbaijan will be reserved for the needs of LTE mobile communication, Ramin Guluzade, Azerbaijani Minister of Transport, Communications and High Technologies, said at the Caspian Innovation Conference in Baku on Dec. 5, Trend reports. Guluzade noted that technical work on the matter is already underway. "As in international practice, frequencies will be allocated through auctions, and therefore a package of proposals is being prepared for making appropriate amendments to the legislation. Allocating a low frequency range through an auction will reduce the operators' investment burden, liberalize the telecommunications market and promote the wide-range development of the LTE network." Guluzade said. To date, mobile penetration rate in Azerbaijan is 106 percent, the minister noted. Internet access is provided to 80 percent of the country's population and the number of wireless broadband users reaches 73 percent. About 68 percent of Azerbaijani households have computers.